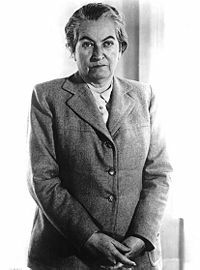 Gabriela Mistral (April 7, 1889 – January 11, 1957) was the pseudonym of Lucila Godoy y Alcayaga, a Chilean poet, educator and diplomat who was the first Latin American to win the Nobel Prize in Literature, in 1945. Though her personal life was often struck by tragedy, Mistral played an important role in changing Mexican and Chilean educational systems. Mistral published over 30 collections of poetry in her lifetime. Some central themes in her poems are nature, betrayal, love (especially maternal love), sorrow and recovery, travel, and Latin American identity as formed from a mixture of native and European influences. Mistral's poetry is influenced by her Christian faith and a recurrent theme in her poems is that of a "rebirth" after death; and, hence, liberation from the world. Some of Mistral's best known poems include: Piececitos de Niño, Balada, Todas Íbamos a ser Reinas, La Oración de la Maestra, El Ángel Guardián, Decálogo del Artista and La Flor del Aire. Lucila (the future Gabriela) was born in Vicuña, a small town in northern Chile's Elquia Valley. Her father, Jerónimo Godoy, a vagabond poet and a schoolteacher, abandoned the family when Lucila was only three years old. She lived with her mother, Petrolina Alcayga, who was also a schoolteacher, and sister, Emelina. When she was nine, Lucila attended rural primary school and Vicuña state secondary school until she was 12 years old; she was later home-schooled by her sister Emelina. Nonetheless, later in life Mistral was awarded honorary degrees from the University of Florence and the University of Guatemala. At age 14, she began working as a teacher's aide and began to teach rural classes in secondary schools when she was fifteen. When her mother died in 1929, Lucila dedicated the first section of the book Tala (Feeling) to her. In 1906, while working as a teacher at La Serena, Lucila met and fell in love with Romelio Ureta, a young railway worker, who killed himself in 1909. The profound effects of death were already in the young poet's work. Writing about his suicide however, led Mistral to consider death and life more broadly than previous generations of Latin American poets. The tragedy continued when two of her friends committed suicide in 1942; and, later, when her nephew Juan Miguel committed suicide as well at age 17. Mistral never married, but adopted a child who subsequently passed away. After Mistral was invited to help reform the schools in Mexico, she traveled widely and lived in Spain, Portugal, Brazil, Mexico, Central America, the United States, the Antilles and Puerto Rico. She only returned to Chile for two brief visits, in 1938 and 1954. Mistral lived in France and Italy between 1925 and 1934, where she worked for the League for Intellectual Co-operation of the League of Nations. During this period she wrote many newspaper and magazine articles for various periodicals. Around 1913 the pseudonym Gabriela Mistral first appeared. It is believed that she formed her pseudonym either from the two of her favorite poets, Gabriele D'Annunzio and Frédéric Mistral, or as a combination derived from the Archangel Gabriel and the chilly wind that blows down from the Alps and cooling the plains of Southern France, which is known as a mistral. Using her pseudonym, she submitted three sonnets under the general title Sonetos de la muerte (Sonnets of Death), which told the story of love and death. She won first prize for these poems in the Juegos Florales contest, organized by the city of Santiago. After winning the contest, Mistral's work become more well-known, and newspapers and magazines throughout South America began to invite her to write for them. Subsequent to winning the Juegos Florales she rarely used her given name of Lucila Godoy for her publications. Mistral published her first collection of poems, Desolación (Despair) in 1922. The main themes of this collection are that of Christian faith, pain and death. In Descolación, Mistral honestly expresses the passion and intensity of the grief she felt over her first love. In 1924 Ternura (Tenderness), a collection of poems dominated by the theme of childhood, appeared. This collection is a celebration of the joys of birth and motherhood. Ternura was followed by Tala (Feeling) in 1938, which also focuses on the themes of childhood and maternity. In 1945, Mistral became the first Latin American woman to receive the Nobel Prize in Literature, which she accepted on behalf of Latin America. The death of Mistral's 17-year-old nephew, as well as her responses to tensions of the Cold War in Europe and the Americas, are the subject of the last volume of poetry published in her lifetime, Lagar, which appeared in 1954. A final volume of poetry, Poema de Chile, was edited posthumously by her friend Doris Dana and published in 1967. Poema de Chile describes the poet's return to Chile after death, in the company of an Indian boy from the Atacama desert and an Andean deer, a huemul. 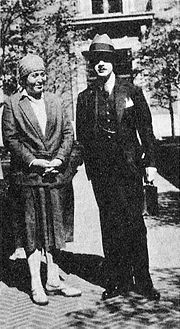 Gabriela Mistral with Colombian painter and sculptor Santiago Martínez Delgado at Columbia University in NY, c. 1939. In 1918, Mistral was appointed director of a secondary school for girls in rural Punta Arenas. Mistral's advancement in Chile's national school system continued and, in 1921, when she was named director of the newest and most prestigious girls' school in Chile, the Santiago Normal School. This meteoric rise as an educator was due to Mistral's extensive publications, which were directed at a diverse audience from schoolteachers to students to other poets; which included some of Mistral's first texts, such as Diario Radical de Coquimbo and La Voz de Elqui, which were published in a local newspaper in 1905. She left Chile in 1922, when she was invited to Mexico by that country's Minister of Education, José Vasconcellos, to take part in a program of educational reform. Mistral joined in the nation's plan to reform libraries and schools, and start a national education system. She introduced mobile libraries to rural areas to make literature more accessible to the poor. In 1923, Mistral was awarded the title of "Teacher of the Nation" by the Chilean government. She left Mexico for Europe in 1924 before returning back to Chile. Later in life, Mistral taught Spanish literature at Columbia University, Middlebury College, Barnard College, Vassar College and at the University of Puerto Rico. In 1924, Mistral began a new career as a diplomat for the Chilean government, and left for Europe in 1926 as an official emissary. In 1933, Mistral entered the Chilean Foreign Service, and became an ambassador-at-large for Latin American Culture. She represented Chile as honorary consul in Brazil, Spain, Portugal, Italy and the United States before and during World War II. Poor health eventually slowed Mistral's traveling. During the last years of her life she made her home in New York, and worked as the Chilean delegate to the United Nations in her later years. After a long illness, Mistral died on January 11, 1957, in New York. She was buried in the cemetery in Montegrande village, in the Elqui Valley, where she lived as a child. Her own words, "What the soul is to the body, so is the artist to his people," are inscribed on her tombstone. Following her death, American poet Langston Hughes translated a selection of Mistral's poems into English; and several anthologies of her work were published shortly after her death. Not only was Mistral a great writer and educator, but she influenced the work of another young writer, Pablo Neurada, who would later go on to be a Nobel Prize winner like herself. Mistral was among the earlier writers to recognize the importance and originality of Neurada's work, having known him while he was still a teenager. She was a school director in his home town of Temuco. She introduced Neurada, as well as others, to the work of European poets; and her emotional poetry, constantly weaved with the theme of love, influenced Neurada's work. Mistral's poetry has withstood the test of time and remained popular and influential. She was able to feel and write accurately and passionately about her emotions, and, in doing so, became a symbol of idealism for the Latin American world. ↑ Gabriela Mistral (1945) www.poetseers.org Retrieved February 13, 2008. ↑ Gabriela Mistral: The Nobel Prize in Literature 1945 nobelprize.org Retrieved February 13, 2008. ↑ Gabriela Mistral (1889-1957) - pseudonym of Lucila Godoy Alcayaga www.kirjasto.sci.fi Retrieved February 13, 2008. ↑ Gabriela Mistral (1889-1957) www.kirjasto.sci.fi Retrieved February 13, 2008. ↑ Deborah Felder, The 100 Most Influential Women of All Time A Ranking Past and Present, 283. All links retrieved May 17, 2017. This page was last modified on 17 May 2017, at 16:40.